Welcome to the Twenty Five 25. With our great Location, easy access, professional on-site management, resort-style amenities, and roomy floor plans make Twenty Five 25 the perfect choice for active lifestyles. Our spacious floor plans offer the perfect blend of comfort and convenience at an affordable price. Located minutes from George Bush Turnpike with easy access. In addition, KidsU offers Language Arts program and after school programs to our residents. 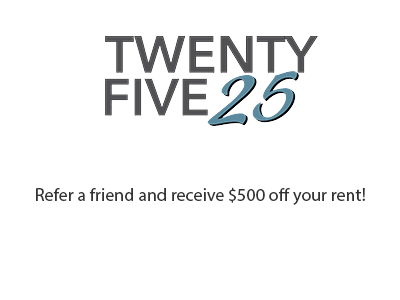 Call or come by and visit Twenty Five 25 today. You will be glad you made the choice.